Attention all, Maha SSC HSS students in their board classes. Are you finding it hard to manage your academics along with the stress to come up any working solution? If yes, answer to it is Chekrs. 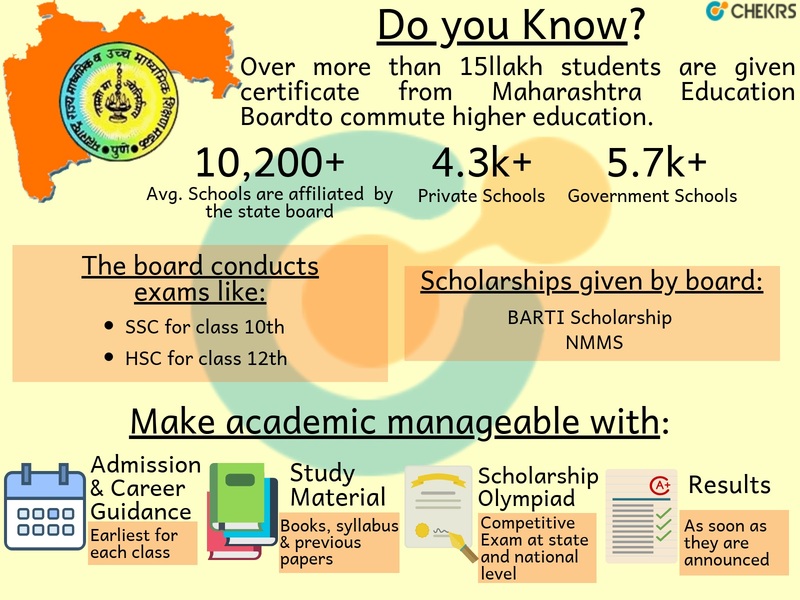 Know Your Board: Maharashtra State Board of Secondary and Higher Secondary Education is established under act in 1965 to conduct SSC and HSC exams. Since then the ministry has been focusing on better education in coming days. After coming to higher classes it is not easy for all students to find a perfect balance of the day to day tests, studies and advance preparation for exam along with it. Whether your year has just begun or it more than half way, arriving at Chekrs can give you complete information of academic activities your board is planning for you. In terms of managing your studies, we provide you officially release Maha Time Table along with dates to keep you ready with tied knots. Also, you can use the Maharashtra Board Syllabus to keep your studies on track. Meanwhile, more simplification has been done in your studies by reducing burden of books through Maharashtra Board Books pdf. Once when done you can even download and solve SSC HSC Maharashtra Board Previous Papers. To promote participation of each student in extra activities besides regular studies, scholarships are one of the best. For all who are interested in studies can enrolling in the Maharashtra Scholarships for Class 10 12 programs and schemes to get utilize maximum from your knowledge. Here at Chekrs we keep you updated with every upcoming exam and how you can excel in them. Why Chekrs for Maha Board Class 1st To 12th ? Chekrs has been working to give true information which can helps every student to find right path for him. For the same, here we give career guidance so that they can become more career oriented. Here we give information to 10th students on what subject combinations to take as per their interest and future scope. Similarly, after 12th guidance is given on available courses available for every specialization.